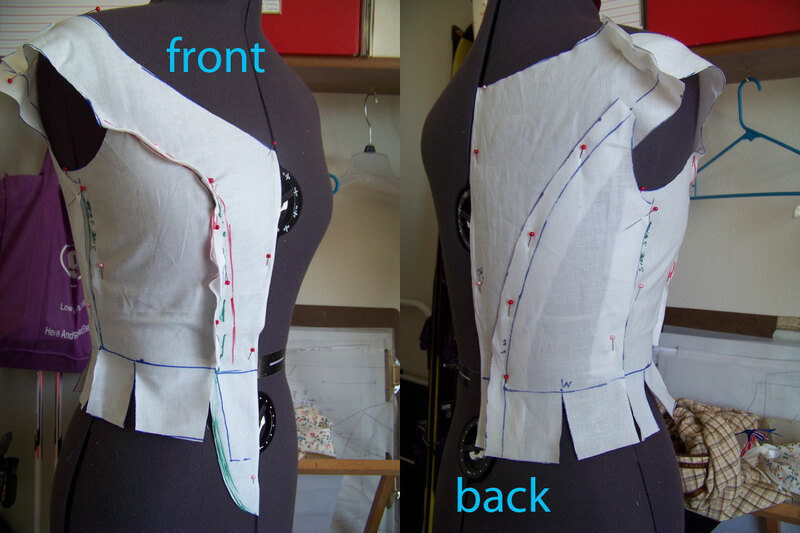 Ah, the joyous process of draping and drafting. There is nothing quite like developing a pattern from nothing, finding the shapes, getting the exact fit. I don't claim to be *good* at it, only passable, and of course, each time we do it, we get better. ...but in Version 3, I've dropped the waist down a good two inches or more to where my actual waist is, which conveniently falls at the bottom of the indicator on Millies' waist. 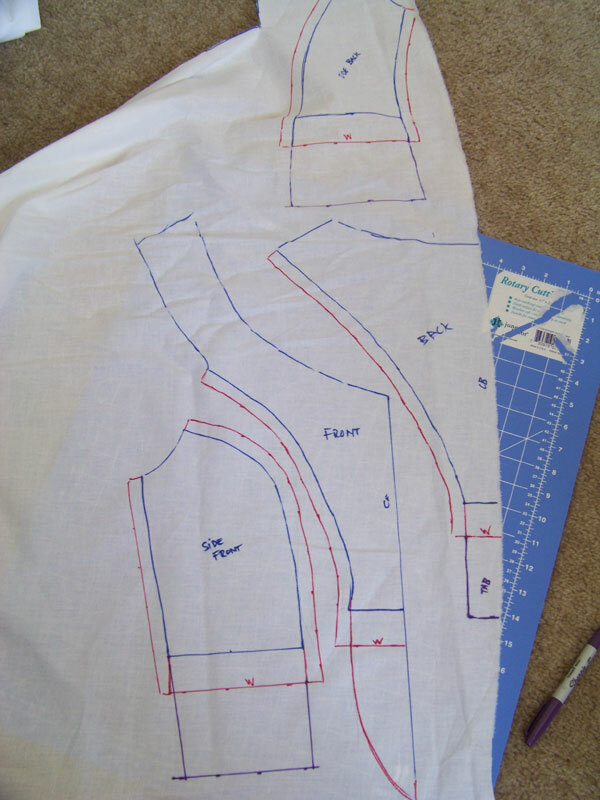 I've come up with a pattern I'm very happy with. How historically accurate is it? Probably not at all - the front seams are curved over the bust. 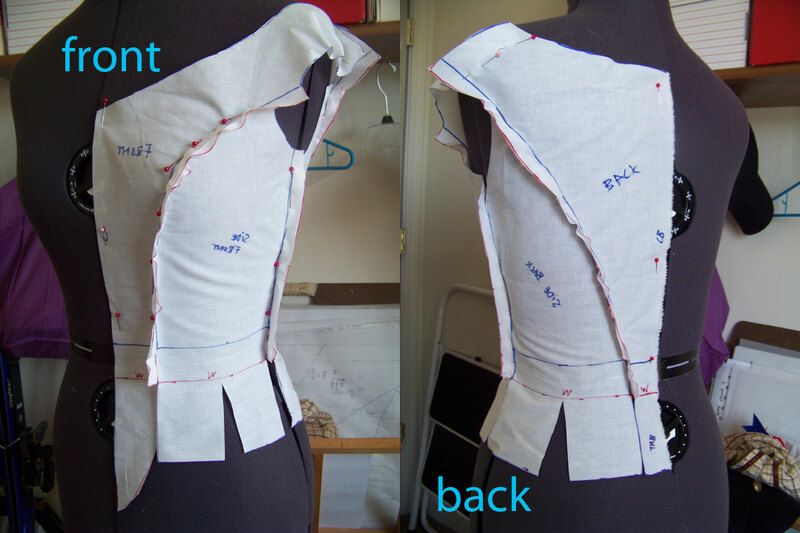 I did this because a) I wanted perfect fit, particularly in the off-the-shoulder scooped neck, and b) because tons of silver trim will be covering that seam, and it made sense to put it there instead of in an area where it will not be covered in trim. The muslin pattern, pinned together, fit me perfectly (despite looking rather rumpled in the photos here), so I've gone ahead and cut the canvas interlining and cotton lining...but that is for another update! Looks great! 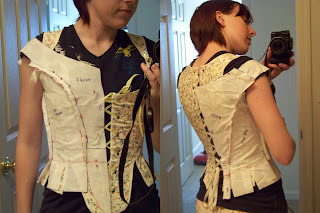 I feel so inspired to sew 17th century now! I just need to move first! Moving! That's always a monkey in the wrenchworks! Well, my dear, it was you in the first place who tipped the scales in my feeble costuming brain, to sew something extravagant and shiny and 17th century! I have you to thank! Now get to work! Yes, moving by the end of the week. To dream apartment and with dream man, so ultimately all good!